http://instructor19.ksp-online.in/. Last date to online form submission is 15-02-2019. Candidates must have qualified Degree for applying this KSP Instructor recruitment 2019. Candidates selection will be through Physical Standards tests PST/PET and written exam. First Physical tests will be conducted for this KSP Instructor recruitment 2019. Detailed information about this KSP Instructor, Assistant Instructor recruitment 2019 age limits, qualification, physical test details, exam pattern and syllabus details are updated below. 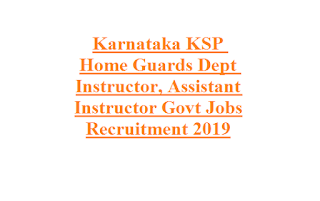 There are total 42 vacancies are in this KSP Home Guard & Defense Services Recruitment of Instructor and Assistant Instructor jobs. Candidates belongs general category age limits are 21-26 years and for others 21-28 years. Degree qualified candidates are eligible to apply for this Instructor posts. 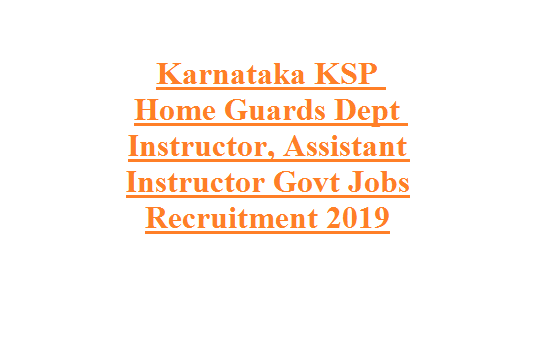 Apply online for this Karnataka State Police Home Guard Dept vacancies through official website of http://instructor19.ksp-online.in/. Last date to online for submission is 15-02-2019. Physical Test Details, Physical Test date, PET hall ticket, result, exam syllabus and pattern and other details are available in this this website only.